Pre-order NOW from B&H Photo-Video! A quality zoom lens can be a photographer's best friend. If you only have room to take a single lens on a vacation or are in a place where having bulky camera bags is a problem they can be a real lifesaver. The downside is that most zooms are bulky, heavy and don't have the same image quality as a prime lens. Tamron is trying to change that with the announcement of their new 17-35mm F/2.8-4 Di OSD (Model A037) zoom lens. The A037 weighs just over a pound at 16.2oz and measures a scant 3.5 inches in length, making the new 17-35mm lens the smallest, lightest zoom lens in its class (ultra-wide angle zoom lens with an F-stop faster classer than F/4 for 35mm full-frame DSLRs). This lens features 15 elements, four of which are LD (low dispersion) in ten different groups. 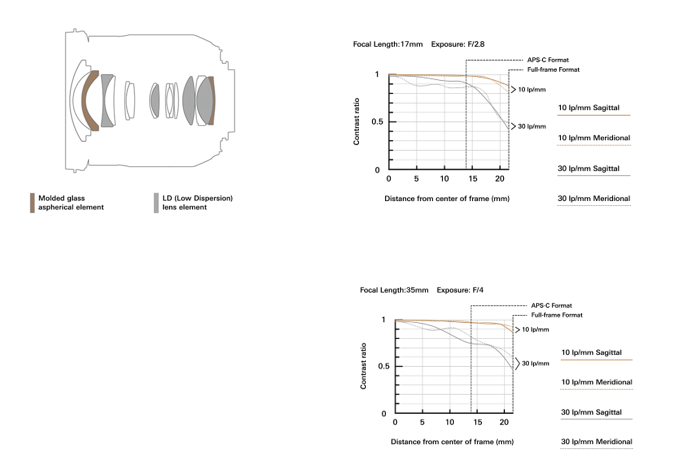 When those LD elements are combined with two strategically placed Glass Molded Aspherical lenses, the lens is capable of correction distortion and aberrations. The new 17-35mm also takes advantage of a Broad-Band Anti-Reflection coating to reduce reflection, ghosting, and flares which is essential on a lens this wide. Other great features include an Optimized Silent Drive (OSD) and a 7-blade diaphragm for a more circular aperture to get smooth bokeh shots. It's also moisture resistant and has a fluorine coating on the front element to protect your lens from water, oil, dirt or whatever comes its way. 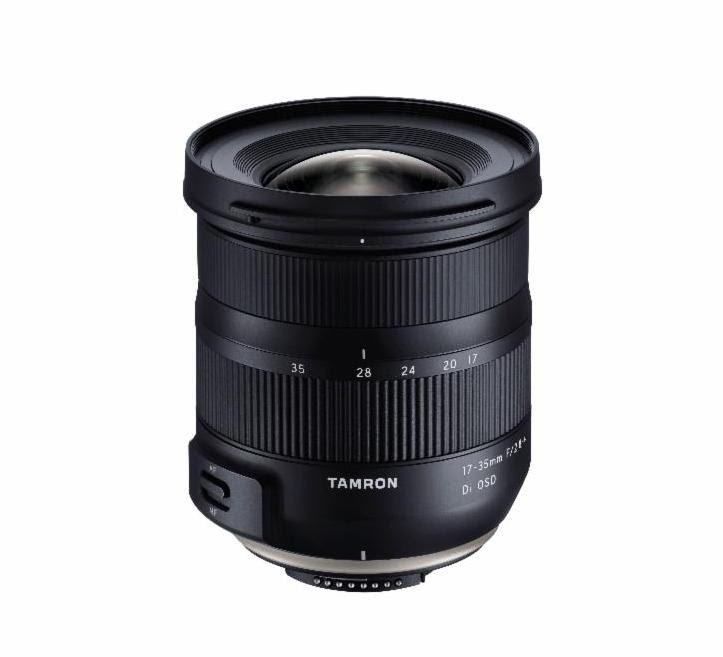 The A037 is also compatible with TAMRON TAP-IN. Which allows you to update the lenses firmware and adjust the autofocus when it's connected to a computer with a USB connection through the TAMRON TAP-IN console. Weight (Canon & Nikon): 16.2 oz. The new Tamron 17-35mm F/2.8-4 Di OSD will be available in Nikon and Canon mount only. The Nikon mount goes on sale on September 4, 2018, at an MSRP of $599 and the Canon's availability will be announced at a later date. However, you can pre-order today HERE at B&H PhotoVideo! The optical construction (15 elements in 10 groups) uses four LD (Low Dispersion) lens elementsto minimize axial chromatic aberrations that can occur with ultra-wide-angle zoom lenses. With two properly positioned GM (Glass Molded Aspherical) lenses, distortion and other aberration can be satisfactorily corrected as well. Being the smallest and lightest in its class and dedicated to high-quality imaging, the engineers have paid particular attention to size. The lens has also been carefully designed to allow peripheral point image reproducibility and thereby facilitate a high degree of sharpness and contrast. The Minimum Object Distance (MOD) for the entire zoom range is a short 11 in., so background blurring is still possible when opening the aperture and approaching the subject close-up with this ultra-wide-angle zoom. Minimum Object Distance : 11.0 in. Maximum Diameter : Ø3.3 in. Length* :for Canon 3.6 in. : for Nikon 3.5 in. Weight : for Canon 16.2 oz. : for Nikon 16.2 oz. "New Eyes for Industry" is Tamron's philosophy. This creed is consistent with the company's position as a manufacturer of a wide range of original optical products, from interchangeable lenses for SLR cameras to various optical devices for both the general consumer and OEM. Tamron makes optical products that contribute to a range of different industries and will continue to devote its rich creativity and leading-edge technical prowess to various industrial fields. Furthermore, Tamron is fully aware of its responsibility to the environment and aspires to help preserve the natural environment in all its business activities.